How many of you have been down the “less is more” road? I have read quite a bit about minimalism, and how it can positively impact other aspects of life. For example, if you have fewer plates and cups, you will have less dishes to do. If you have a capsule wardrobe, you will love everything you wear and get dressed with ease. If you have less knick knacks, cleaning is simpler. This all sounds pretty good, right? I’m sold but not so great at execution. Have any of you embraced a minimalistic lifestyle? I have been trying to simplify our lives as a whole. I want to cook with real foods, raise boys that would prefer playing outside to sitting in front of a screen, and to focus on our well being, not on what we don’t have. Yet, I still find myself buying food that is more convenient than whole, using TV as a crutch and wishing I had things that we don’t. I have purged my closet multiple times and am left with the bare minimum, which I like a lot. I definitely see holes in my wardrobe, and I will fill them in over time. I have pared down items in my kitchen, and it definitely helps. I know what kitchen gadgets I have, and there is nothing hiding in the dark corners of my cabinets. I cut down my mugs in half, and it’s fine. Who knew?! About 1/8 of the boys’ toys got donated or shared with friends, and I wish I could do more but am having a hard time. We keep a large stash of toys in our guest room, and every so often I swap them out to keep things new and fresh for the boys. And what you see in the photo above is about half of the toys they have in their main play area, which is in what used to be our dining room. I cleared our ottoman and found so many things in there that we didn’t need to keep. Now, it houses a small bin with diapers and wipes, a tray in case we need it to hold drinks, a current book and magazine, and a lint roller for the couch because we have dogs that shed. I can see everything now, and I can get to items so we can actually use them. In the kitchen, last fall I really embraced baking bread from scratch and I’m so glad I did. Bread has simple ingredients, doesn’t take that much effort and is so good. Meal planning and cooking a few things ahead of time helps keep food real and nutritious. It’s the nights when we have no plan that I end up pulling ravioli out of the freezer. I have tried various methods of meal planning and haven’t quite settled on one yet. Thoughts? My nightstand should only contain a few items but houses far more. The top drawer of my nightstand has everything from jewelry to a flashlight. I’d love to be able to put a book in my top drawer and keep the surface clear. As for the bottom cabinet…does anyone else keep perfume they don’t wear? Why? Why do I have multiple bottles? I’d like to ditch the old, tattered linens, and eventually buy a set of nice sheets for each bed in the house. Since it’s now the colder season, crockpot cooking is the way to go, so I’d like to do a slow cooker recipe a week. I even have a pressure cooker, which is fantastic for beans, rice and a. ton of other things. Nutritious foods don’t have to be difficult, but you do have to plan a little. Purging is good for the soul, and it feels great to drop unneeded items for donation. I hope to think more about what I bring into our home, and to live with less, appreciating what we have. I have read about classes and programs to streamline the process, but I’m okay taking my time to do this. And at the end of the day, it’s all about making my boys the best people possible, making sure they appreciate what they have, and for that I will stay the course no matter how long it takes. 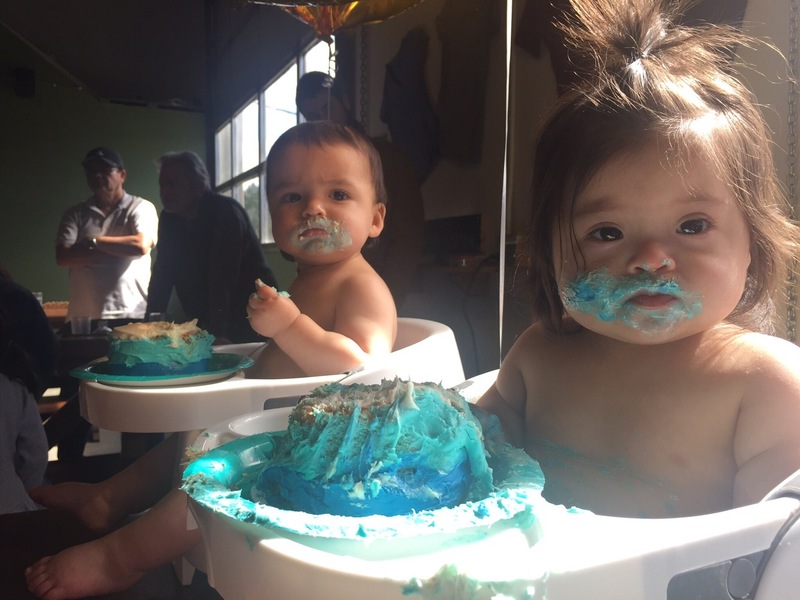 That’s right everyone, my boys are one year old. They are both doing fantastic, growing and developing like champs. Oh and they are really into frosting right now. Not cake. Frosting. For those of you curious about what they are doing from a developmental standpoint, here’s where we are. Giovanni has been pulling himself up for months, using the couch, ottoman, baby gates or nearest person. He recently started taking some chances and letting go for a few seconds and standing. We also practice walking, with him holding our hands, and he loves that. He talks a lot and says things like mama, dada, and nana very clearly. He loves to feed himself using his hands and has gotten quite good at it. He’s a handful and we adore him. Dominic has perfected his “leap frog”. This is his current way of getting around, as we are still working on crawling. He has all of the right ideas but apparently bouncing on all fours and then hurling himself forward is far more enjoyable. He can put himself in sitting up position on his own and he does it with ease now, and he sits up very straight and strong. We are trying to get him used to bearing some weight on his legs, and with our help he is able to stand for a good 30 seconds, sometimes even longer. He babbles a ton, and says mama and dada very clearly. We are working with a feeding specialist to learn how to chew, move his tongue laterally, and to strengthen all of the mouth muscles. With that said, puréed foods are still his jam. We do offer small pieces of food and he eats it just fine, but it mostly just gets swallowed. All in all, his PT and OT are very pleased with his progress and we are extremely proud, he’s perfection. It’s so hard to believe that they were this small once, but what an amazing year it has been. These boys have taken us on quite the ride, and we’ve loved every minute. If anyone out there has any questions regarding their development, how my typical baby is helping to teach my DS baby, or how they compare to one another, I’m happy to share what I’ve noticed and learned. I’m not an expert at all, just a mama. Please just ask, I’m happy to share. I would like to dedicate a post to Giovanni today. He does not have therapists coming to the house to play with him, and in baby class we discuss Dominic’s progress more than his. Doctors appointments are often more about his brother, or sometimes they are entirely about his brother. He may not notice it now, but in years to come I’m sure he will, and I’m also sure that it will be something we need to handle with care. Giovanni and I share a special bond. Everyone says he looks just like me, and Giovanni has nursed since day one, so he and I have always had that. He is often referred to as a mama’s boy because he likes to be with me and sometimes I’m the only who can bring him comfort and calm. As a newborn, he was fussier than his brother, but he has always been a wonderful baby, so curious and funny. As he has gotten older, he definitely has a mischievous streak and lots of energy. He is a very busy guy and has lots to do — those toys aren’t going to play with themselves. He loves to pull himself up on the baby gates, knock down towers of blocks that we build up for his knocking down pleasure, and he really enjoys pretending to read books. That’s right, he doesn’t like being read to these days because he can hold his own book and read to himself. He makes us laugh and has the sweetest chubby cheeks around. His gummy smile can stop you dead in your tracks. Giovanni, if you were to read this one day, here is what I would like for you to know. You are everything to us. You were put here in this world to bring smiles, laughter and joy. You, and you alone, are special. Is it wonderful that you have a twin? Of course! Is it wonderful that you are your brother’s best friend and teacher? Yes! But YOU are enough. I will always cherish my quiet moments alone with you, when I held you close and smelled your head while kissing you. I will always be grateful that I was able to nurse you and know what it felt like to feed you and have that bond. Just because we often have to give a little more time and energy to your brother does not mean that we do not want to spend it with you. Life is never easy and straightforward, and sometimes we will make mistakes, but no matter what, we love you. Our lives are defined by what we do and how we live, so we will always be intentional and loving with our words and actions. Please know that we are doing our best and that we cannot imagine our lives without you. You make life so much better. As most of you know, one of my twin boys has Down Syndrome and the other does not. One thing I have found is that we have not come across many other families like ours, so I thought it might be helpful to share our experience thus far. No, we did not know Dominic’s diagnosis before birth. I think this is a good jumping off point. We did not know that Dominic would have DS but we were aware of the possibility. Because I was pregnant with twins and had undergone IVF, I was immediately referred to a specialist because I was considered high risk. There, it was suggested that I take a chromosomal blood test to check for any abnormalities. Although the test could not tell us a definitive yes or no, it could tell us if there was a greater chance of one or both babies having a chromosomal abnormality. My test revealed that there was a greater chance for one or both of the babies to have DS. 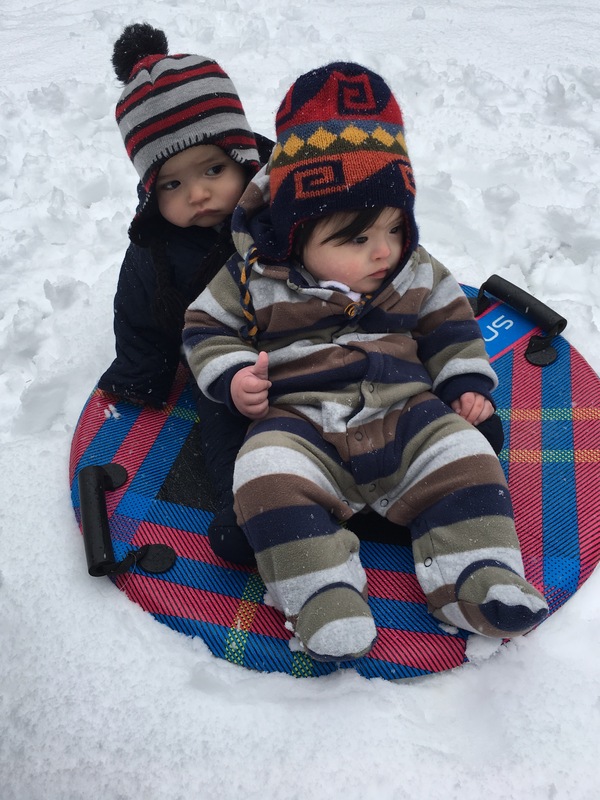 At that point, they asked if we wanted to do further testing for a definite answer, and we chose not to put our babies at risk because we knew it didn’t matter to us. I had a relatively easy pregnancy and neither babies showed any “soft markers” for DS. Many babies show signs of having DS while in utero, but both babies looked perfect until the last month of my pregnancy. 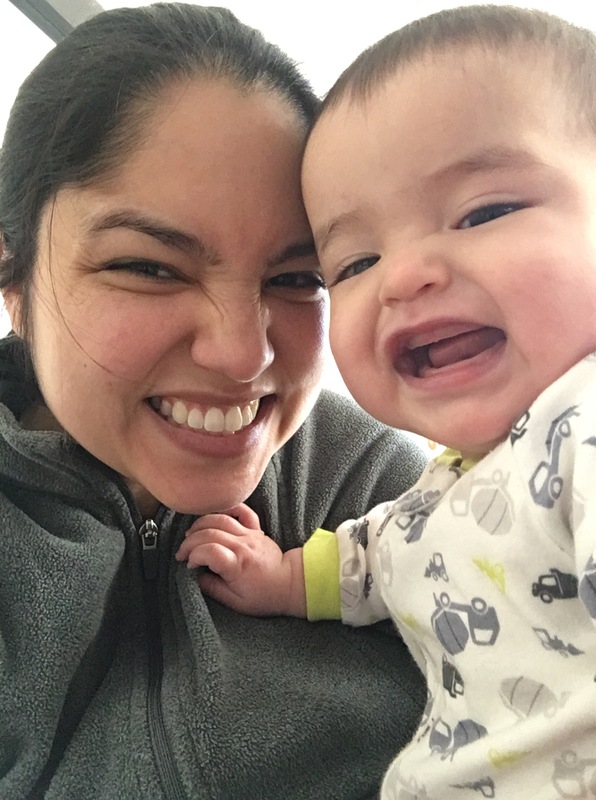 Dominic’s growth had slowed down and there was a definite placental issue, so instead of letting me go to full term, my doctor decided to induce me at 37 weeks. In that last month, as a final attempt for Dominic to gain some weight, I increased my protein and caloric intake. It worked and my boys were born at 37 weeks at 5 lbs 5 oz and 5 lbs 12 oz. 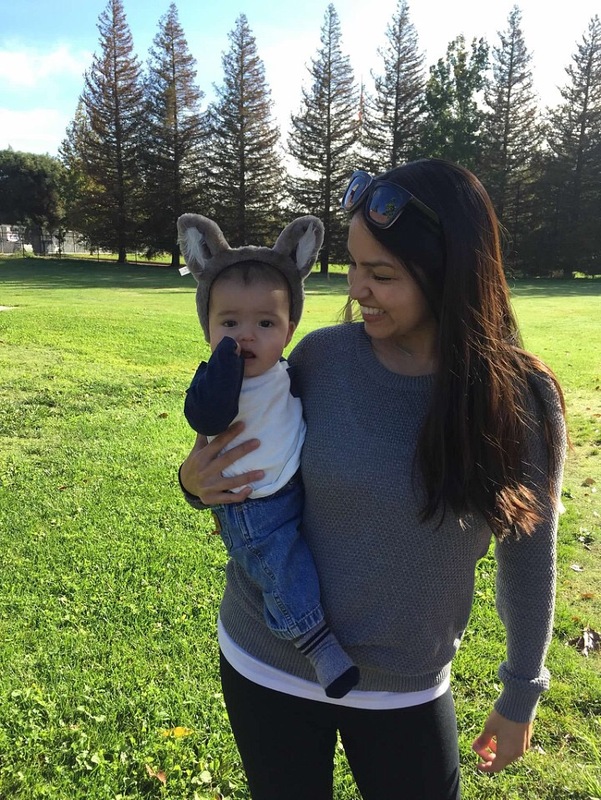 From birth, we could see that Dominic could have DS but he lacked a lot of the physical traits, so the only way for an accurate diagnosis was to get his umbilical cord blood tested. Shortly after birth we received the confirmed diagnosis. A lot of people share that they felt grief upon learning their new baby has DS. I think that the early on chromosomal test is when I grieved. I took that news very hard because we had worked so hard to get pregnant and I felt like once we actually got pregnant, everything would be perfect. I was worried that we would have anything less. Little did I know, my boys are beyond perfection. I know how that sounds, but it’s true. While we were still in the hospital, there was a moment with Dominic that I will always cherish. I took him in my arms and held him close, smelling his head and kissing his face, telling him how I felt about this life we would share together. I told him that people may not see how special and wonderful he is right away. They may make judgements before they get to know him. That things may be harder for him. That we will need to support one another every step of the way. But first and foremost, he is loved and wanted. We could never possibly understand what this love would feel like. To be a new mom and have these two gorgeous babies was nearly too much for my heart–I thought it could burst. Twins are a very special and unique thing. My boys have known each other since the very beginning, and to see them smile at each other, you know that their bond is unbreakable. I know that there will be fights and jealousy, but I believe in my heart that they will always support one another. I feel like they were born to be together, to be best friends. 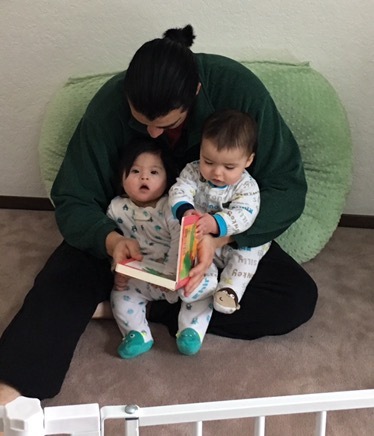 To know that Dominic will teach Giovanni to love without bounds and to be inclusive, while Giovanni will teach those around him by his example, is such a gift. I think that they will be each other’s biggest fan and protector. So, yes, one is not like the other and that’s how we like it in our home. True individuals but cut from the same cloth. Lots of friends and family say thing like “twins, I don’t know how you do it”or “twins, I can’t imagine”. I’ll tell you exactly how I do it, and spoiler alert, I’m not a one woman show. I will say this…I don’t mind patting myself on the back for choosing the best partner imaginable, but other than that, I am just fortunate. My husband, my rock, scored a job that allows him to work from home. Now, Marv does have to do a little travel and has appointments that take him away from home, but it isn’t often, and when he’s home, he’s amazing. His mama raised him right. Marv does everything for the babies and he even washes my pump parts and all of the baby bottles at the end of the day. He actually has a very sweet bath time ritual for the boys, and I love that he has that time with them. Above all, he is present, and I appreciate having a partner that is cherishing this time as much as I am. On a daily basis, my dad is there for us. 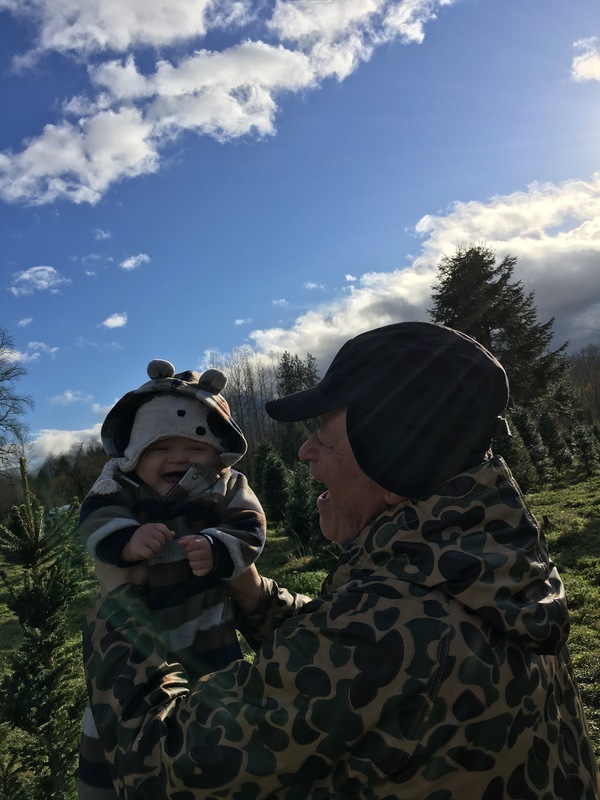 My dad treats being a grandpa like the best job he has ever had. First and foremost, he moved from California to Washington and bought a house ten minutes away from us. The babies were born in March and he closed on the house in April–he’s been here since day one. He comes over every day during the week around 9:30 and stays until around 5:30. My dad changes diapers, feeds the babies, goes with me to baby class, will stop at the market if we need anything, and he takes the dogs out for potty breaks. We are so lucky to have him here and so involved. For those of you keeping score, that’s THREE adults and TWO babies. Most of the time there are at least two of us caring for the babies, but there are times when I’m alone. Often, I’m only on my own for a few hours. Mornings are actually kind of amazing and among some of my favorite moments. I love looking at Dominic holding his own bottle and stroking his hair, while gazing down at Giovanni nursing and playing with my necklace. And, to see them sitting side by side in their high chairs, eating like big boys, is so sweet. It can get tricky and sometimes there is more crying when I’m alone, but babies cry and it is okay. I always remind the boys that “mama has two babies” and that I’m doing my best. I wonder if I can enjoy moments alone because I know that help is on the way. 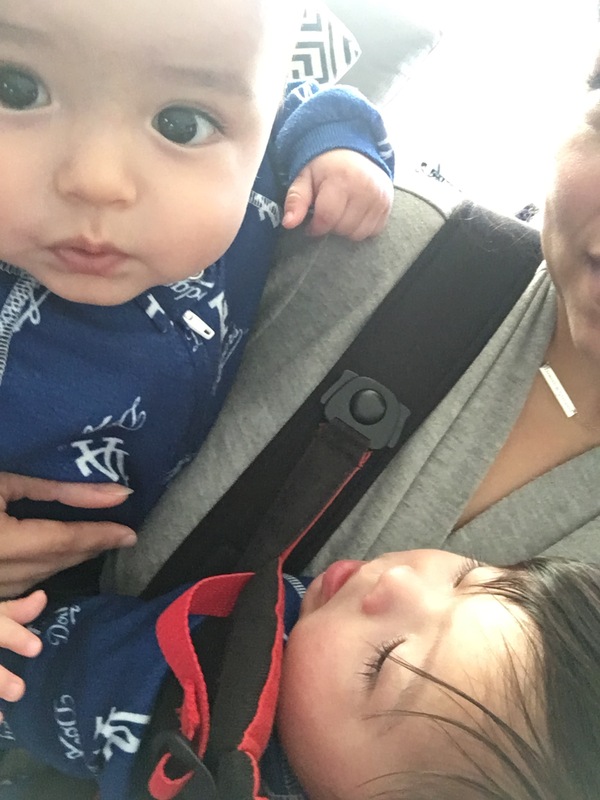 Sometimes, I call myself a “twin mom poser” because I’m not like other twin moms, toting two car seats into Target or wearing two babies at once. I need to stop that, I’m not being kind to myself. Every mama’s journey is different, and you do your best to give your babies the best life possible. That’s it. You don’t need to be Superwoman. 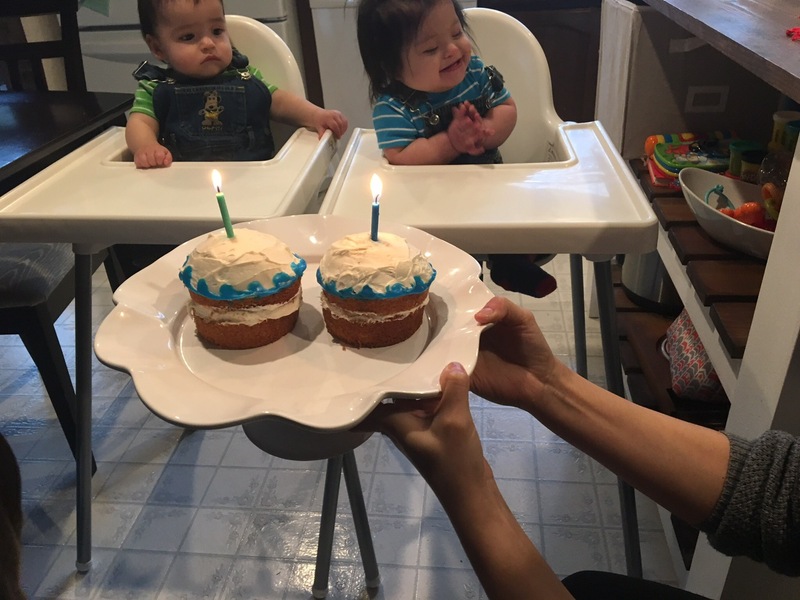 The last time I shared a post, the boys were 3 months old, and so much has changed since then as we approach their first birthday. I have missed writing here and sharing about our life, so I have given the blog a new look and will be sharing as much as possible about what’s going on here. I will, of course, be more focused on motherhood, but I will still share about cooking and food, secondhand finds, home renovations and decor, and our adventures. For any of you that are new here, allow me to fill you in a bit. 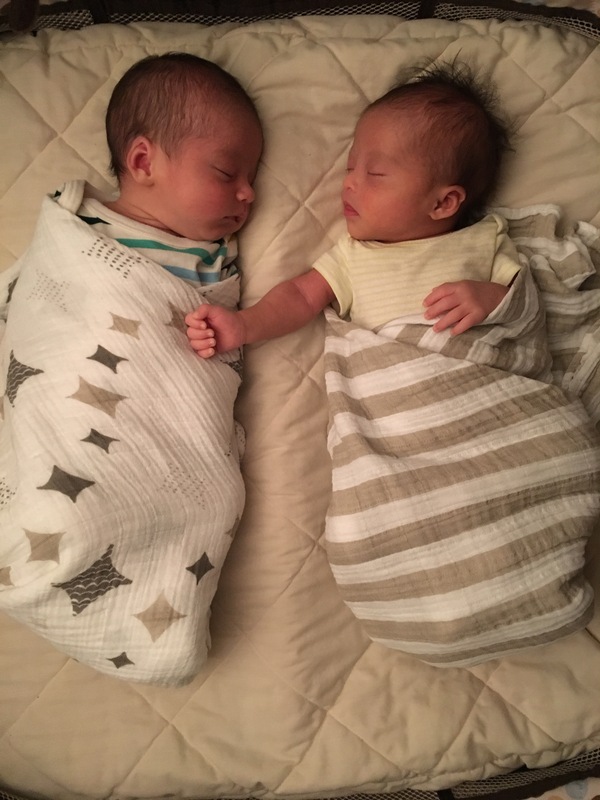 After a long struggle with infertility, the combination of an amazing doctor and his team of nurses along with tremendous support from family and friends, we hit the baby jackpot and became pregnant with twins. Our boys are the greatest gift imaginable and our lives are forever changed. Giovanni is spunky and curious, while Dominic is sweet and soulful, and their love for each other is clear. Dominic was born with Down Syndrome, so not only are we new to parenthood and twin life, but we are also a part of this wonderful Down Syndrome community. Back when I was writing more regularly, we were in the first home we purchased, enjoying Taco Tuesdays, I worked full time, and my adventures involved lattes and concerts. 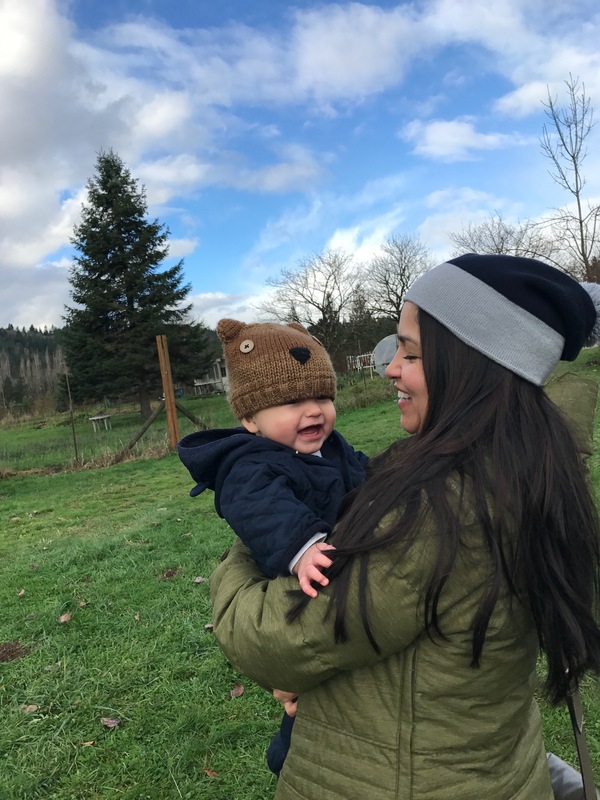 Nowadays, we are in our forever home, and as a full time stay at home mom, I cook more often than Tuesdays and it’s not usually tacos, and our adventures are leisurely walks and sometimes include farm animals. Life has evolved into something new and it’s pretty amazing. I do hope that you’re along for this new ride with me and my tribe. The boys take a lengthy nap in the mornings, so I’m able to shower, eat breakfast and prepare for the day. Yesterday was not the smoothest of mornings, but we won’t get into that. Today has included one of those perfect moments, and I think I will remember it forever. I heard Dominic’s stirring go from quiet and content to angry and loud. As I picked him up from his crib, he stopped crying immediately and buried his sweet face into my chest. I held him close and took in his amazing baby smell. We walked from room to room, talking about what we saw, pointing out family members in photos. We eventually ended up in the living room and snuggled up on the couch. The quiet in the house was something I rarely hear. There were no barking dogs, no babbling baby noises, no hum of a rock n play baby seat, and no chatter of the television. We sat there together and I told him the story of how I met Marv, how we fell in love, and how badly we wanted to expand our family and have babies. I told him how hard it was to do something that seemed so natural and simple. I told him how happy we were to learn that we were going to have two babies. And most importantly, I cried a little as I told him how wanted and loved him and his brother are. I told him how special and perfect we think he is. I’d love to say that he fell asleep in my arms at that moment, but this isn’t a movie, this is real life. Really, I had to put him in the Bjorn to get him to sleep because I was starving and had to eat some breakfast. In real life with twins, moments like this don’t happen often, or at least they haven’t for me up to this point. I find it hard to have quiet moments with one baby, but today…today, I did. I will always cherish this perfect moment. My name is Brittney. I am a wife and mother to beautiful twin boys. We have two dogs, live in the burbs and love our simple life. Who is this kid, going up the stairs on his own??? We are so proud of you, buddy!